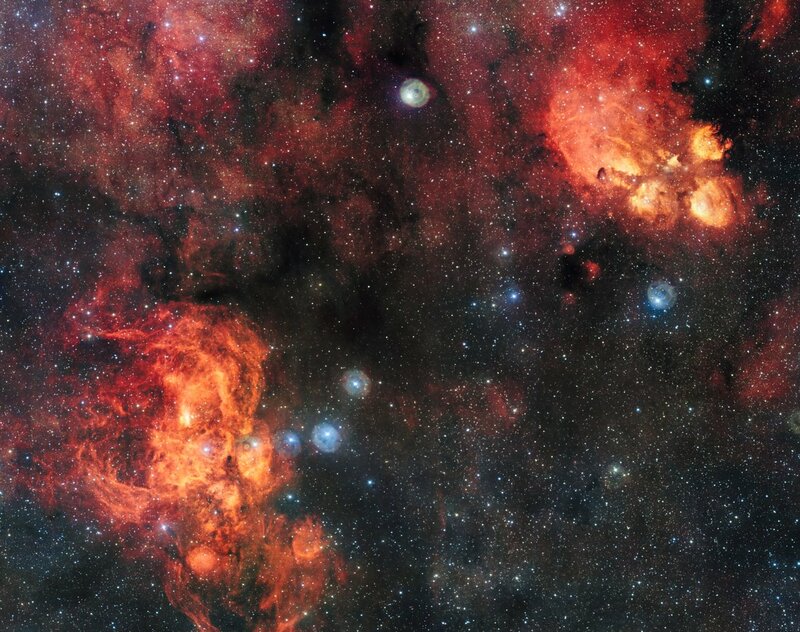 The three toepads visible to modern telescopes, as well as the claw-like regions in the nearby Lobster Nebula, are actually regions of gas — predominantly hydrogen — energised by the light of brilliant newborn stars. With masses around 10 times that of the Sun, these hot stars radiate intense ultraviolet light. It is strange that the caption should just talk about stars with masses around 10 times solar, when NGC 6357, the Lobster Nebula, is home to one of the most massive stars in our galaxy. Pismis 24-1, also known as HD 319718, is the brightest star of the open cluster Pismis 24 within the nebula NGC 6357 about 6,500 light-years away. It was once thought to be the most massive star known, but is composed of at least three individual objects, each still among the most luminous and most massive stars known. The Wikipedia text mentions masses of 74 and 66 times that of the Sun for two of the components of Pismis 24-1.